As a trained stem cell researcher Siddharth Dubey, 27, had an assured scientific career ahead of him. But Dubey, from India’s northern Uttar Pradesh state, was quick to realize that the rapid growth of India’s biotechnology industry was creating business opportunities for scientists. 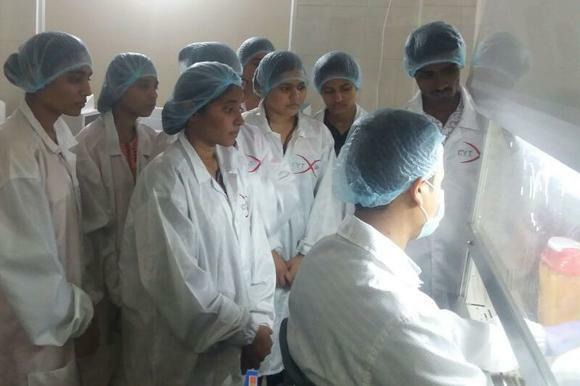 Based in Hubbali, in Karnataka State, Cytxon has won about 50 contracts from companies such as India’s Genei Laboratories, String Bio and Credora Life Sciences. It has monthly revenue of between 200,000 rupees ($3,100) and 300,000 rupees, and aims to reach 3 million rupees in revenues for the 12 months to December 2017. “That’s how lucrative these biotechnology startups can be,” Dubey said. The Biotechnology Industry Research Assistance Council, established by India’s Department of Biotechnology, helps startups from the incubation stage to commercialization. The department has also set up a Biotechnology Ignition Grant, which offers funding up to $75,000 for scientists and entrepreneurs. In addition, there are state-specific policies to assist biotech startups. The potential for startup clinical research organizations, known as CROs, exists “because there is significant cost advantage in what they are offering,” said Pushpa Vijayaraghavan, a life sciences analyst and director of Sathguru Management Consultants in Hyderabad. “They can deliver the same service [for] one-tenth of the cost” charged by large CROs, she said. Most startups have landed contracts from major Indian companies — including Cipla, Dr. Reddy’s Laboratories and Sun Pharmaceutical Industries — to do basic biochemical work, such as the study of enzymes and chemical reactions. But about 18% of contracts are research focused. Big companies typically refuse to comment on their outsourcing policies, or to name CRO partners. But the trend can be identified in publications by the CROs. For example, ImageProVision Technology, a Pune-based startup specializing in processing detailed image analysis, lists Glenmark Pharmaceuticals, Aurobindo Pharma, Sun Pharma, Dr. Reddy’s and Cipla among its clients. “For a biotech company to undertake research work is not easy,” Dubey said. “They have to spend a lot setting up a new facility, hiring the right people and also investing in all the raw material needed for research.” Startups “already have the experts and the laboratories,” he said. Manoj Nerurkar, the company’s chief operating officer, said that for most companies, setting up research infrastructure that meets global quality standards requires significant investment. Bringing in a CRO means not having to invest in recruiting a quality scientific talent pool. Smitha Murthy, founder and CEO of Bangalore-based Credora Life Sciences, said outsourcing benefits both big companies and startups. “For any company, the biggest cost is in setting up a laboratory with state-of-the-art technological equipment,” said Murthy, whose company has awarded several projects to Cytxon. For startups, such investment is a one-off cost that can be spread across various projects. Pandorum Technologies of Bangalore is one example. The developer of 3-D printed tissues has successfully created a functioning liver tissue. “It is not just supplying the functional tissue but a contract for all the research that goes into making it,” said Arun Chandra, the company’s co-founder. Chandra said health care companies have begun asking Pandorum to make other body tissues. “In this way, while what we do can be termed as CRO work, we are still conducting research for our own product or project,” he said. Dubey said all biotech startups in India are involved in some aspects of CRO services. “The initial grant offered by the government for any biotech startup is not more than 1 million rupees,” he said. “That amount, though good on paper, doesn’t match the cost of buying equipment, setting up a laboratory, hiring people and then the most important cost of marketing your own product [or] drug,” Dubey said.